A Grown Up Pajama Party!!! On February 17th, the Today Show did a piece on hosting a sleepover as a way to keep kids occupied during the Siberian Express. It made me think, even though 2015 is already filled with some great occasions; weddings, graduations and births; why not do our own pajama party for grown ups?! My favorite part, of course, is putting together the menu. Let’s do breakfast foods and trick them out for an evening party! No breakfast party menu would be complete without a Mimosa or Bloody Mary so break out your finest recipe and make a couple of pitchers. A Bloody Mary Bar is always a fun way to get your guest’s creative juices flowing. You could even have a contest for the best, worst and most creative Bloody Mary. Make your own Bloody Mary Mix, I’ve added one for you to try, if you don’t already have a favorite, and leave all the ingredients out for your guests to personalize their drink and for the contest. Be sure to have a couple of flavored salts to rim the glass. If you need more inspiration go to www.foodiecrush.com Heidi has some awesome ideas! There’s a restaurant near me that makes an amazing Brunch Carbonara. Instead of long pasta, they use orzo (a rice shaped pasta) and they put a poached egg on top instead of mixing it into the sauce. This is a really sophisticated way to incorporate breakfast into a dinner menu. A sleep over staple is pizza. 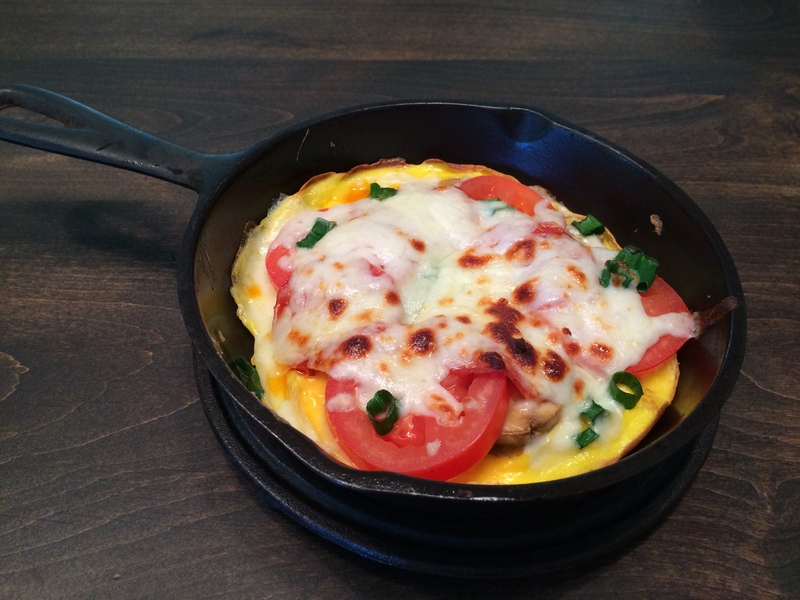 So for fun let’s do a Pizza Frittata. It is so yummy! I feel like we have to have something sweet to finish it off and of course what’s more breakfasty than Rice Krispy treats. I’m sure you have a favorite recipe you love. An old friend of mine told me the real secret is a freshly opened box of Kellogg’s Rice Krispies. Great! We have invitations, food, and drinks. Let’s have some fun! If you have a friend that is handy with a movie-editing program, have them cut together scenes from classic movies with sleepover scenes. There are movies such as Pillow Talk and Pajama Game but even Grease has a great sleepover scene. You can project the movie loop on the walls. For our party I had everyone send over their top five party songs and hired a DJ to play them in the mix with other fun dance music. If you have a group that will get up and dance on their own, you’re set. If you feel like your friends might need a little motivation first, ask your DJ if he has party dancers. You can even call a local dance school and see if any of their students would like to help to get your guests moving. You only need them for an hour or so. Once the party gets going your guest will be on their own. I think it is fun to give your guests a little gift at the end of the night. Krispy Kreme will do a two pack of donuts and you can add a package of instant cocoa mix or a small carton of milk. Another cute idea is to do hangover prevention kit. Be sure to include a packet of Tylenol, small bottle of water and a cookie. Be sure to send me pics of your party using the hash tag #pajamaparty. In a large pan cook pancetta over a medium heat until crisp. Remove with a slotted spoon, and drain on paper towels. Leave one tablespoon of the fat, in the pan. Add the butter to the pan and cook gently until it just starts to brown. Pour in the orzo, and stir until toasted and coated well. Pour in 4 1/2 cups of the stock. Bring to a boil over high heat, and then reduce heat to maintain a simmer. Cook uncovered, stirring occasionally, until the orzo is tender but al dente and the stock has been absorbed, about 8 minutes. Stir in the cream and add the frozen peas, bring back to a simmer. Toss the pancetta into pan, and add half of the Parmesan cheese and all of the thyme. Stir well, and then season to taste with salt and pepper. Add the remaining stock so you have a nice creamy texture. Turn off the heat. Toss with half the remaining cheese. Top with eggs. Garnish with chopped parsley and serve with remaining cheese. 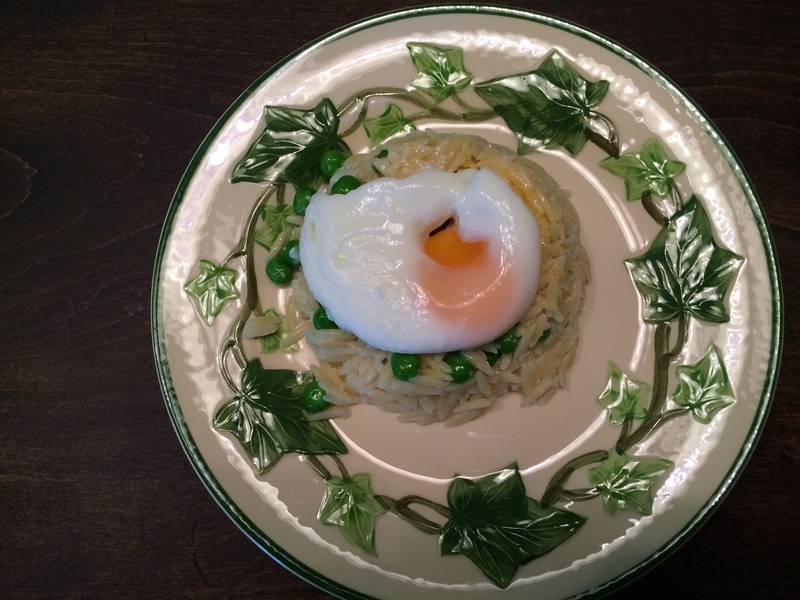 *If you haven’t yet mastered the poached egg, you can use fried eggs. I l am really enjoying the trend of crispy eggs, fried in olive oil. Cook together sausage and bell pepper, for about 5 minutes. Break up sausage with a wooden spoon. Add garlic scallions and mushrooms. Cook until sausage is cooked through and veggies are tender. You can add 1 teaspoon of olive oil, if needed. In medium bowl, whisk together eggs, water and seasonings. Pour over sausage mixture in skillet and cook until eggs are set and top is almost dry. This should take 10-12 minutes. Arrange tomato and pepperoni slices on top, like a pizza. Sprinkle with mozzarella cheese. Broil until frittata is puffy and cheese is melted, about 1 minute. You can slice wedges, like a pizza or serve whole on a warmed plate. Squeeze the lemon and lime wedges in a shaker and then drop in. Add the remaining ingredients and fill rest of the way with ice. If you are adding the vodka ahead of time, add 1 cup quality vodka. Shake to mix thoroughly . « A Last Minute Valentine Toast to Love!